The widespread application of high-throughput sequencing in studying evolutionary processes and patterns of diversification has led to many important discoveries. However, the barriers to utilizing these technologies and interpreting the resulting data can be daunting for first-time users. We provide an overview and a brief primer of relevant methods (e.g., whole-genome sequencing, reduced-representation sequencing, sequence-capture methods, and RNA sequencing), as well as important steps in the analysis pipelines (e.g., loci clustering, variant calling, whole-genome and transcriptome assembly). We also review a number of applications in which researchers have used these technologies to address questions related to avian systems. We highlight how genomic tools are advancing research by discussing their contributions to 3 important facets of avian evolutionary history. We focus on (1) general inferences about biogeography and biogeographic history, (2) patterns of gene flow and isolation upon secondary contact and hybridization, and (3) quantifying levels of genomic divergence between closely related taxa. We find that in many cases, high-throughput sequencing data confirms previous work from traditional molecular markers, although there are examples in which genome-wide genetic markers provide a different biological interpretation. We also discuss how these new data allow researchers to address entirely novel questions, and conclude by outlining a number of intellectual and methodological challenges as the genomics era moves forward. Niche construction can lead to coevolutionary episodes and greater specialization, and can have implications for the evolution of biological diversity, so understanding how individuals adjust their behavior to conspecifics and heterospecifics over changing social and environmental gradients presents an interesting research problem. The objective of our study was to test the hypothesis that mixed flocks of gulls and diving ducks congregate as a result of interacting over food. Ducks are vectors that carry zebra mussels (Dreissena polymorpha) up from the bottom of a water body, and gulls consume this type of food. We investigated the interactions of 2 gull species with 3 benthivorous duck species—Common Pochard (Aythya ferina), Tufted Duck (A. fuligula), and Greater Scaup (A. marila)—in the Szczecin Lagoon, Poland. 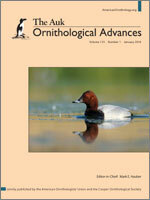 We found that the presence of gulls in duck flocks was closely correlated with foraging by ducks. Eighty-four percent of foraging duck flocks (>5% of the flock members were foraging) and 52% of nonforaging duck flocks (<5% of the flock members were foraging) were accompanied by gulls (Fisher's exact test, P = 0.008). The odds ratio showed that every 10% increase in the number of foraging ducks doubled the chance of gulls being present (odds ratio of 10% unit change = 2.058). We defined the relationship between the size of the foraging duck flock and the number of gulls present in it; the number of gulls rose with increasing numbers of ducks in the flock. All our findings confirmed that this gull–duck co-occurrence was the result of interaction over food (commensalism or interspecific kleptoparasitism). We showed that the diet of gulls in the Szczecin Lagoon changed dramatically when Aythya ducks made their appearance; after duck arrival, gull pellets contained almost exclusively mussels. Our results reveal that the trophic relationship between zebra mussels and the studied bird species is not just a straightforward one between predator and prey. Blackpoll Warblers (Setophaga striata) breed across Canada and the northern United States and fly across the Atlantic Ocean to South America in fall. Studies of fall migration in this species have centered on the extensive overwater flights but have ignored other aspects of this migration, including potential geographic variation. We used Blackpoll Warbler banding records from 3 coastal (Atlantic seaboard) sites and 9 inland sites to study the fall migration. The sites covered a wide range of the species' geographic distribution during breeding and fall migration in North America. The data spanned the years 1967–2013, though the particular years sampled varied considerably among the stations. We found that the Blackpoll Warbler's fall migration is occurring later by ~1 day decade−1. Young birds generally moved through western sites before adults, whereas at eastern sites the reverse was generally true, which suggests that young birds are taking longer on migration. We also found that young birds were in poorer condition than adults, which may lead to an overall decreased rate of migration due to shorter flights and/or longer stops. Wing chords differed between western birds (longer wings) and eastern birds (shorter wings), and wing chords from the 2 more southerly coastal sites may reflect mixing of these groups. Birds were captured at coastal sites >10 days later than at inland sites, even when at similar latitudes. The heaviest individuals and those with the most fat were found at the 2 more southerly coastal sites from late September to mid-October. These results suggest that Blackpoll Warblers from the west move toward the east, where they develop the energy stores needed for their extensive overwater flights. Generalist avian nectarivores visit flowers that produce copious sugar-dilute nectar, and some species can not compensate energy intake when fed solutions with low sugar content (≥5% w/w). Intake of dilute sugar diets by specialist avian nectarivores is limited by salt content, but the potential role of salt on nectar intake of generalist nectarivores has not been tested. We examined intake rate and digestion of solutions with varying sucrose concentrations (2.5–30% w/w) by Red-legged Honeycreeper (Cyanerpes cyaneus) and the effect of salt content (20 and 40 mM L−1 NaCl) on the intake rate and digestion of dilute sucrose solutions (2.5% w/w) of this generalist nectarivore. We tested the hypothesis that Red-legged Honeycreepers do not show compensatory feeding when fed dilute sugar diets, and that salt limits the intake rate and digestion of these solutions. We found that this generalist nectarivore showed compensatory feeding when fed sucrose diets ≥5%, but they did not compensate sugar intake when fed a 2.5% sucrose diet. Sucrose intake, sucrose apparent assimilation, and body mass increased when birds were fed dilute sugar diets to which NaCl was added. Addition of salt facilitated feeding on dilute sugar diets, probably by reducing Na+ losses, and increasing Na-dependent glucose transport. Further work on the renal and digestive physiology of generalist avian nectarivores would clarify the role of salt on the intake of dilute sugar solutions. We interpreted the results of nuclear DNA sequencing to be inconsistent with the recognition of California Gnatcatcher (Polioptila californica) subspecies. McCormack and Maley (2015) suggested that our data did support 2 taxa, one of which was P. c. californica, listed as Threatened under the Endangered Species Act (ESA). We summarize here how 2 sets of researchers with access to the same data reached different conclusions by including different analyses. We included the southern subspecies' boundary from the taxonomy of Atwood (1991), the taxonomic basis for the ESA listing, which resulted in an Analysis of Molecular Variance that provided no support for subspecies. In contrast, using a novel taxonomic hypothesis without precedent in the literature, McCormack and Maley (2015) found statistically significant FST values for 2 loci, which they suggested supports P. c. californica. We propose that our mitochondrial and nuclear data had sufficient power to capture geographical structure at either the phylogenetic (monophyly) or traditional “75% rule” level. McCormack and Maley (2015) suggested that finding an absence of population structure was a “negative result,” whereas we consider it to be the null hypothesis for a species with gene flow and no geographical barriers. We interpret the unstructured mtDNA and nuclear DNA trees, the STRUCTURE analysis supporting one group, the identification of just 26% (and not 75%) of individuals of P. c. californica with the most diagnostic nuclear locus, the overall GST that suggests that over 98% of the variation is explained by nontaxonomic sources, and the lack of evidence of ecological differentiation to indicate that P. c. californica is not a valid subspecies. McCormack and Maley (2015) suggest that statistically significant differences at 2 loci that explained <6% of the genetic variation, and previous morphological data, support recognition of P. c. californica. If ornithology continues to recognize subspecies, these different standards should be reconciled. Population age structure is important for understanding population dynamics, but can be difficult to resolve in landbirds due to the limited number of age classes discernible by examining plumage. In forests of western North America, Black-backed Woodpeckers (Picoides articus) typically colonize burned areas shortly after fire, but densities decline within 6–10 yr. This pattern is often assumed to result from adult Black-backed Woodpeckers abandoning territories when food resources wane, yet long-distance breeding dispersal is relatively rare in birds, whereas long-distance natal dispersal is more common. To determine whether colonization of newly burned areas is driven primarily by breeding dispersal of adults or natal dispersal by young birds, we captured 57 adult Black-backed Woodpeckers in 6 burned areas in California between 1 and 8 yr after fire. We used patterns of multiple feather generations retained among primary coverts, secondaries, and secondary coverts to assign birds to 1 of 5 age classes (second-, third-, and fourth-calendar-year; after-third-calendar-year; and after-fourth-calendar-year). Population age structure varied dramatically across burned areas, with a preponderance of second-calendar-year birds in the 1 yr and 2 yr postfire areas, and a preponderance of birds at least 3 yr old in the older postfire areas. Poisson generalized linear mixed models (GLMMs) revealed that the effect of years since fire on woodpecker age was highly significant (z = 3.575, P < 0.001). Our results indicate that natal dispersal is the primary means by which Black-backed Woodpeckers colonize recently burned areas in western forests, and that breeding dispersal is uncommon. The decline of Black-backed Woodpecker populations 6–10 yr after fire likely reflects the lifespan of individual birds that colonized the burned area, or of offspring that they produced in the early postfire years. Our discrimination of Black-backed Woodpeckers into 5 age classes confirms previous suppositions about plumage-based age determination in woodpeckers, and is likely applicable to other woodpecker species. Birds use atmospheric updrafts to subsidize soaring flight. We observed highly variable soaring flight by Black Vultures (Coragyps atratus) and Turkey Vultures (Cathartes aura) in Virginia, USA, that was inconsistent with published descriptions of terrestrial avian flight. Birds engaging in this behavior regularly deviated vertically and horizontally from linear flight paths. We observed the soaring flight behavior of these 2 species to understand why they soar in this manner and when this behavior occurs. Vultures used this type of soaring mainly at low altitudes (<50 m), along forest edges, and when conditions were poor for thermal development. Because of the tortuous nature of this flight, we describe it as “contorted soaring.” The primary air movement suitable to subsidize flight at this altitude and under these atmospheric conditions is small-scale, shear-induced turbulence, which our results suggest can be an important resource for soaring birds because it permits continuous subsidized flight when other types of updraft are not available. The discovery of spatial patterns in naturally occurring isotopes (e.g., δ2H, δ13C) at continental scales has been tremendously important in providing a method to infer potential breeding and wintering origins of migratory animals through assignment to tissue-specific isoscapes. Single-isotope (i.e. δ2H) assignments of birds to molting origins in South America have been limited by the lack of strong spatial gradients in precipitation δ2H there. We integrated an mvnpdf (multivariate normal probability density function) approach using δ2H and δ13C values in tail feathers to determine wintering origins of adult Barn Swallows (Hirundo rustica) breeding in eastern Canada (n = 208). Spatial assignments were conducted using precipitation (δ2H) and theoretical plant-based (δ13C) isoscapes for South America calibrated for feathers of Nearctic–Neotropical migrant songbirds. We also measured feather δ34S values of Barn Swallows equipped with geolocators (n = 9) and of a larger group of Barn Swallows (n = 121) of unknown molt origin to assess the possibility of using this isotope to identify birds molting in coastal habitats and for which the terrestrial δ2H isoscapes would potentially be invalid. We constrained the mvnpdf assignment to areas generally south of the Amazon basin, based on data retrieved from Barn Swallows fitted with archival light-level geolocators from Ontario (n = 3) and New Brunswick (n = 11), Canada, which showed consistent overwintering fidelity to south-central South America. The majority of birds from our breeding populations were assigned to south-central Brazil. Results from the δ34S analysis indicate that a threshold of 11‰ may be appropriate to constrain the use of terrestrial δ2H isoscapes in South America. Our results refine the toolbox available to examine migratory connectivity in species that molt on their South American wintering grounds and underline the value of using multiple proxies for assignments of animals to spatial origin. Studies across annual cycles are important for understanding the consequences of carryover effects and predicting species' responses to environmental change. Partially migratory populations, which consist of resident and migratory individuals, are excellent systems for studying how wintering strategies may affect reproduction. We examined whether wintering strategy (residency or nonresidency) created temporal divides in egg-laying date within a local breeding population of American Kestrels (Falco sparverius) and thus led to assortative mating and genetic divergence between early- and late-breeding birds. For 3 yr, we trapped and marked kestrels in winter and recaptured mated pairs in nest boxes in the subsequent spring. We then genotyped early- and late-breeding kestrels using 6 polymorphic microsatellite loci. Residents nested earlier than nonresidents, but not after the warmest and driest winter of the study. Resident females were more likely to mate with resident males than nonresident males, providing behavioral evidence of assortative mating. However, we found no genetic differentiation or structure between early- and late-breeding kestrel groups. Lack of genetic differences may be the result of condition-dependent changes in wintering strategy, renesting, recent emergence of assortative mating patterns, or sufficient gene flow from pairs with mixed wintering strategies. Nonetheless, our results show that wintering strategy can have carryover effects on nesting phenology and mate choice in partially migratory populations. Given that wintering strategy affects nesting phenology and that nesting phenology has consequences for local fitness, environmental conditions (i.e. warmer winters) may facilitate kestrels remaining in or near temperate breeding areas and may lead to shifts in migratory behavior and nesting phenology.